Review: I was born in the same year that Willy Wonky and the Chocolate Factory was being filmed, so I’ve never known life without Gene Wilder and the cast of kids singing and dancing their way through the chocolate factory. 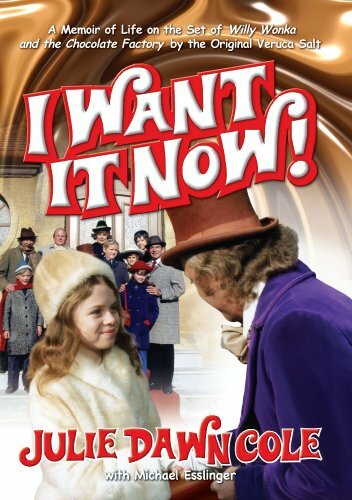 Like many little girls, demanding, impetuous Veruca Salt was my favorite character. She may have wanted it now, but I wanted to be her. When Julie Dawn Cole’s memoir of life on the set showed up as a Kindle book for under $3, I had to have it. I mean, I enjoy memoirs in general, but this book spoke to the child in me as well as the adult. I enjoyed her memories of the set, the filming, the other kids. Her real life wasn’t so great when she was young, and while none of the kids made a fortune on the film, her income helped keep her mother and sister safe and healthy. This memoir isn’t terribly profound, or incredibly important (except, maybe, to Ms. Cole herself), but it’s an interesting, candid account of a marvelous adventure with enough of “what happened after” to make it feel complete. Ms. Cole is still a working actor, while the other kids who were part of the film left the business (the boy who played Charlie grew up to become a veterinarian – how cool is that? ), so technically, I guess that’s a happy ending. Great read, especially if you’re a fan of the film.